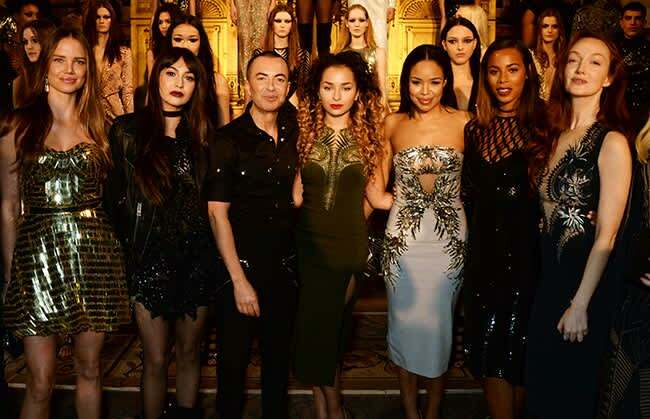 Julien MacDonald brings the house down with dazzling LFW show | HELLO! Julien Macdonald gave a typically dazzling performance as he showed his new collection at London Fashion Week on Saturday. The fashion designer, known for dressing some of the world’s most famous women, showed off a series of showstopping dresses that wouldn’t look out of place in Kim Kardashian’s wardrobe. We saw glitter, sequins, tassels and sheer panels as his army of models, including Grace Bol, took to the runway. Julien’s front row was as starry as usual. This time, Chatty Man host Alan Carr joined the line-up alongside Rochelle Humes, Julien MacDonald fan Millie Mackintosh, HFM’s covergirl Alicia Rountree and songstress Ella Eyre. The fashion designer, who recently opened up to us about visiting Kim Kardashian in her LA home, was also showing the world his new men’s collection. Closing the show, one of Julien’s girls took to the runway in a white lace off-the-shoulder dress featuring an ostrich feather skirt. Julien also made an announcement at the show, revealing that he will be designing a newborn clothing collection for Mothercare called SMILE by Julien. To mark the launch, the model who closed the show walked the catwalk with two adorable little children in each hand.